Daria & Kirill - BOUNDLESS HIMALAYAS TREKKING & EXPEDITION (P.) LTD. I am overflowed by the great emotions, I remember amazing landscapes, absolutely new feelings, sincere contact with strong and such beautiful nature, tears of pleasure and a feeling if I were ten years younger. I was lucky with my best friend Kirill, who was sharing my emotions and enthusiasm all the way and who had the same physical training. But we both were very lucky with our guides, very kind and attentive people, helping us continually in every way! Actually we warned you about our arrival less than in a day! You so hospitably met us at the airport and brought to the office, you didn’t know how long was our holiday and how we want to spend the time. 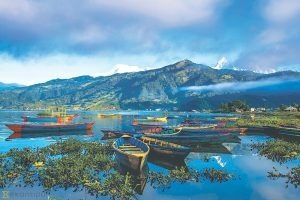 I only had time to drink a cup of tea and say that I want to take everything from my life, as you already drove us back to the airport for the plane in Pokhara! Less than for half an hour you organized an excellent track, suitable our preparation, physical ability, suitable for our holiday duration (unfortunately, about 1 week), including the day off in Pokhara for shopping and the unforgettable paragliding, with placement in such beautiful and cozy hotel near the lake and impeccable staff! Dear BOUNDLESS HIMALAYAS TREKKING & EXPEDITION. Maybe I’ll never understand why so few people travel to Nepal or Tibet, but they can rest for two weeks on the same beach in an expensive hotel in Egypt. What can be better than mountains? what may be the best test of fortitude than trekking? I hope that my story about one week in Nepal with the events and spiritual growth as one year, will impress my friends and acquaintances. Those who have not walked in the rhododendron forest and saw a cloud of fireflies swirling around you, he missed the magic! The best wishes and success in the business!